81% of OIT patients chose OIT /oral immunotherapy as a treatment with the GOAL to protect against CC and accidental ingestion. 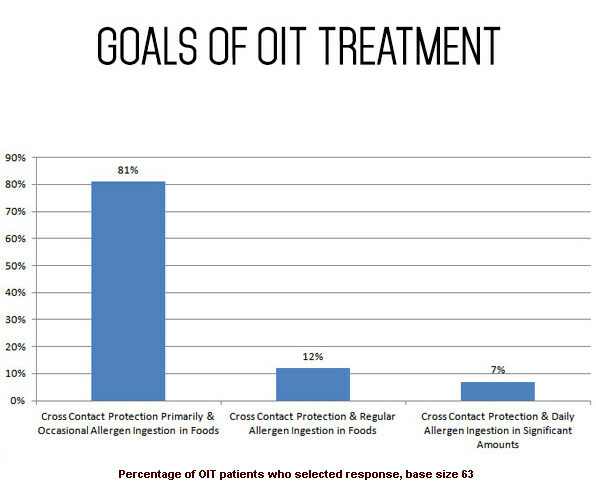 A non-OIT doctor stated publicly that if your goal was “daily allergen ingestion in significant amounts” then that was the reason to pick OIT. We did not think that was true at all, from experience, from the research done on OIT, and other people’s comments in the Private Practice OIT support group. So we took a poll. 75 people have responded. Most of us want PROOF that we are safe from accidental ingestion primarily….to the point that we achieve freedom to eat birthday cake, go to restaurants, travel and sit next to kids with sticky peanut butter. And that proof comes from watching the daily food challenge—> the ingestion of the DOSE. When you see your child eat the allergen, you know they are safe that day. You are not relying on a single food challenge from months or years ago and “hoping” you have protection. * I wanted protection from CC…to be able to live freely and not freak out about “may contains”. Sure, if she liked peanuts and wanted to eat something with them that would be fine, but I can’t say that was a goal for us. Curious to see what others think! * My guess would be this varies a lot depending on which allergen you’re doing OIT for. In our case with eggs, we’re hoping for regular ingestion of at least baked egg. Egg is in a lot of foods. I’d imagine those doing milk and wheat feel the same way. When we do PN/TN, it will be mostly cross contamination protection, and eating it every once in a while. * I originally pursued OIT for CC protection, but our doctor’s protocol aims for full inclusion into the diet. Now that we are done, I’m glad we have full inclusion. * Due to my son doing multi-allergen OIT we are limited (by his belly size) to only getting to CC safe. I’m hoping down the road we can increase one allergen at a time to regular ingestion. * I should have clarified better, I sort of included accidental in “CC”, meaning protection of ingestion of an unknown amount of allergen by accident or mistake vs intentionally eating it occasionally, regularly or daily. * Our end goal is complete and free inclusion in diet for all allergens. Egg,soy, milk, treenuts, peanuts, seeds and chickpeas. Between two kids. * Our protocol has 8 peanuts as maintenance dose; I cannot see my kids eating anymore than that. * My goal is to have her safe from x contain and may contain. Not necessarily for her to eat peanuts! * He was contact and airborne reactive. Our goal was for protection against CCs and accidentals. He eats his daily 8 peanuts, but nothing more….and rarely even any “may contains”. * All I want is for her to be safe from accidental ingestion and to not live in fear or exclusion from activities and places she wanted to go. * She was airborne reactive so just wanted to enjoy normal things kids her age do: baseball games, school lunch, parties etc. However, she now enjoys may contain on a regular basis! But still hates all things that taste like pn, including her nightly dose! * Our goal was for protection against CCs and accidentals. * My goal is for my children to have a normal social and work life, which means eating freely in restaurants, at catered events (the hardest one), and in other people’s homes without fear of cc. I don’t care if they ever have a PB sandwich for lunch, and they certainly don’t. * Protection against CCs and accidental exposure. * It seems that the current scientific protocols for OIT would demand regular ingestion of the allergen throughout life, or until some clinical trials reveal that less allergen ingestion will still provide the necessary protection against anaphylaxis. * I wanted my daughter be able shake/hold hand or give/get hugs with out having to ask what they ate. Her initial known reaction was through skin contact not ingestion. We have blown way past that!!! * Safety and normalcy are our biggest concerns. We started peanut OIT in March. * We will be staring our journey towards OIT this summer (we will be staring with SLIT because of his component test numbers)… and our goal is by far to give our son protection against CC. Manufacturing laws in this country just don’t give us the tools we need to completely avoid – not to mention those that aren’t as detail oriented/informed about ingredients. Not to mention the amount of history and tradition that centers around the very food (peanuts) that could kill our son. We want to give him the freedom to attend baseball games, and social events, and family gatherings without fear. * Our original goal was to be safe from CC, but if we get to a point where the food can be ingested on a regular basis and part of a normal diet, then that’s an added bonus. * Goal: for my kids to live more normally and their friends to have them over without fear. Their dose two weeks into OIT was what a SLIT friend’s child had spent YEARS working up to. Plus, OIT was covered by insurance and SLIT wasn’t.